Habitat for Humanity of Monroe County’s mission is to eliminate poverty housing by building simple, decent, affordable homes in partnership with qualifying families. While many may think Habitat’s work begins at organizing youth groups to build homes and ends in handing off keys, they would be mistaken. Habitat’s focus is broader than that. For those unfamiliar with the organization, Habitat for Humanity is a national organization with chapters around the US whose mission is to provide housing for families in need. Habitat will provide an interest free loan to families so that construction, overseen by Habitat, can begin on their new homes. Once the house is completed, the family will pay back their loan to Habitat in a series of installments. Yet, the process of being approved for a loan is different in each chapter. 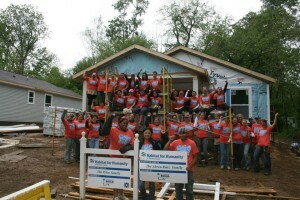 At Habitat for Humanity of Monroe County (HHMC), for example, each family is required to submit an application that, should it meet eligibility requirements and be approved, will enroll the family in a six month finance/wealth management class which each applicant is required to pass before being granted a loan. This six month wealth management class is not a national requirement, but rather an innovation that HHMC has implemented. HHMC doesn’t just want to make their clients home-owners, they want to make them self sufficient home-owners. Kerry Thomson, CEO of Monroe County’s Habitat for Humanity, says “Our real mission is to end poverty and build dignity and to use these houses as launching pads for families to escape the cycle of generational poverty.” This six month class is one of their strategies to help individiuals achieve self-sufficiency that was put into action in 2013. When reviewing their program efficacy, HHMC found it troubling that from 2003-2013 the average rate of delinquency (failing to make payments on a loan) was 18% among new Habitat homeowners. What this meant was that a fifth of all new HHMC home owners were being economically hindered rather than empowered by their houses. When HHMC’s team spoke with their clients about this, a majority of them cited unforeseen economic emergencies, such as a flat tire, or a medical condition that kept them from going to work, as the culprit that kept them from paying their installments. Yet, it was precisely these sort of economic emergencies, and learning how to prepare for them, that HHMC addressed in their six week wealth management class. Why weren’t the two connecting? It has to do with the eternal optimism of the human spirit which has a hard time forseeing future emergencies. You don’t expect your car to get a flat on the way to work until you run over a nail and now have to pay to replace your tire. Similarly, when you are budgeting your paycheck, you don’t expect you’ll need to buy antibiotics for a nasty cough until you’re at the pharmacy hacking. It is precisely their infrequency of these moments that keep people from considering them in their budgeting. The results from extending the length of the curriculum were dramatic. Within six months of implementing the new programming in 2013, HHMC saw a decrease in the first class’ loan failure.Whereas the previous decade of six week classes had seen an average of 18% delinquency, over the course of two years (2013-2015) this new six month curriculum had a mere 2% delinquency rate average. HHMC better equipped itself to meet its missional goals because they spoke with their clients and took action to serve them better. While the progress of the program can be seen in the numbers, Ms. Thomson was candid in sharing that the length of the class can be a challenge to keep people engaged. Whether or not the class excites potential homeowners, it is a requirement to qualify for a loan. And while most are initially hesitant, many become very engaged in the course. For some new homeowners, they would say it was the wealth management class, beyoned their new home, that has led them t a better future. One of the reasons their finance class is so successful is because HHMC collaborates with their clients on making a budget. While some organizations will tell their clients that their buying habits are “wrong” and try to correct them, HHMC has a different approach. Rather than creating a list of necessary or unnecessary expenditures, HHMC tries to empower their clients to see how their spending habits affect their budget and financial goals. Ultimately, HHMC lets the client decide whether or not those habits are helping or hurting them. 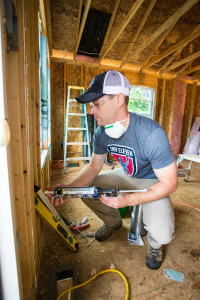 Because Habitat took the time to learn about the stumbling blocks that were keeping their clients from truly thriving, they have become a more effective organization. By analyzing loan deliquency rates, interviewing the individuals they served, and exploring HHMC’s options for enhancing their programming, they have been able to facilitate not only the growth of their own organization but the growth of those they serve. Utilizing the very people your organization serves as your advisors on how to make your programming stronger is a practice that any organization can employ. 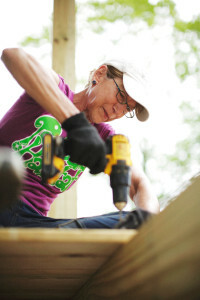 Habitat for Humanity of Monroe County didn’t need to take drastic steps to maximize their impact. It didn’t take a flashy new marketing campaign, a fresh hire, or even a new grant. They simply implemented what they learned from their clients to creatively adapt their programming to better serve their mission. Their best practice is, by far, their desire to see all their clients succeed. They ensure this is done by analyzing their programming, listening to their clients, and seeking out simple solutions that benefit all.